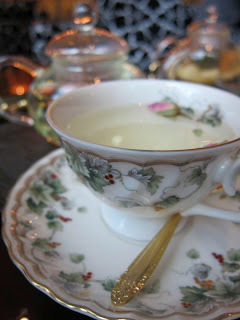 gastronommy.com: The difference between High Tea and Afternoon Tea. The difference between High Tea and Afternoon Tea. Do you really know what high tea is? I frequently hear and see the misuse of the term "high tea" by friends and even on menus offered by five star establishments. Let’s clarify that today. High tea is confusingly used as the label for an elegant mid-afternoon tea (typically known to be enjoyed by society’s tai-tais and proper English ladies). On the contrary, the true origins of high tea was labeled by the UK’s working class as their early evening meal (5pm-7pm), in lieu of dinner. The name high tea was created because of the “high” table it was eaten on, and the foods usually consisted of heartier dishes such as pot pies, sliced meats, custards and hot or cold tea. The term most people are really looking for is “Afternoon Tea” or "Low Tea." Daintier in form and with its own rules of etiquette, afternoon tea is rumored to have been created by one of Queen Victoria’s ladies-in-waiting. To make the long story short, this lady-in-waiting, the Duchess of Bedford had a growling stomach and wanted to nibble and have good mid-afternoon gossip. Inviting her lady friends to Belvoir Castle and encouraging them to leave their corsets at home for a relatively comfortable afternoon snack-a-thon, she began a new trend among the socialites of Britain. Their typical afternoon tea is still similar today with assorted light sandwiches, sweets, cakes and of course, tea. Today, the term “high tea” has been completely misused especially in the United States and Asia… though they do carry the same essence and purpose at the end of the day. Hi Victoria! I can see where you're coming from and I know what you mean. However I'm not so opposed to the loose use of the word "high tea". It's almost a marketing term nowadays because lots of people like the idea of having it regardless of the time of day. Afternoon tea just sounds so boring and ordinary, but "high tea" doesn't. Calling it "high tea" is just for fun. Anyways you do bring up some great facts and I enjoyed your article. Thanks! Thanks for the much needed clarification! This term has been so misused that I think the true meaning has been lost through time and perhaps cultures as well. I say cultures because I read somewhere online (perhaps Openrice ... ) that the term "High Tea" has been used interchangeably with "Afternoon Tea" (of the meaning you stated above) but many who use the term "High Tea" in Hong Kong especially think it is called so because it is often served in fancy establishment like hotels that the whole thing seems so "High" as in fancy and elegant, hence having "HIGH tea." Lost in translation? or just lazy to research? Every single human I've spoken this issue with would not believe me when I told them, the high end afternoon tea that you love going with your mom in Peninsula hotel or Four Seasons is actually called a 'Low Tea'. But then no hotel dares to call it that (except HK Four Season's The Lounge! Kudos to that...) because it'll make them not feel so 'high' above everyone else anymore. The irony is, the most expensive cars in the world all sit very low. Why can't Low Teas be promoted to create the same effect? Its all psychological...! Now I know, and knowing is half the battle. The "high table" etymology sure sounds spurious to me. Among the many meanings of high, the 19th century included "greater than normal," which seems to apply here, as it did in "Lord High Chancellor," or "High Street" for the main street in a town. A high tea then would be less of a snack and more of a meal, exactly as you described.